For the horseradish potatoes, bring a large pan of salted water to the boil and boil the potatoes, in their skins, for 10-15 minutes, or until tender. Drain and, when cool enough to handle, cut into quarters. Heat the olive oil in a large frying pan over a medium heat, then add the potatoes and season, to taste, with sea salt and freshly ground black pepper. Fry the potatoes for 7-8 minutes, turning occasionally, until crisp and golden-brown. Remove the fried potatoes from the pan and set aside to drain on kitchen paper. Meanwhile, for the spiced mackerel, preheat the grill to its highest setting. Score the skin of each mackerel three times on each side using a sharp knife. Mix all of the remaining spiced mackerel ingredients together in a bowl to form a thick, spiced butter and season well with sea salt and freshly ground black pepper. Rub the butter over the mackerel fillets, then grill for 4-5 minutes, turning once, or until just cooked through. To finish the horseradish potatoes, transfer them to a mixing bowl. Stir in the shallots, soured cream and creamed horseradish and season, to taste, with salt and freshly ground black pepper. Stir in the chives. 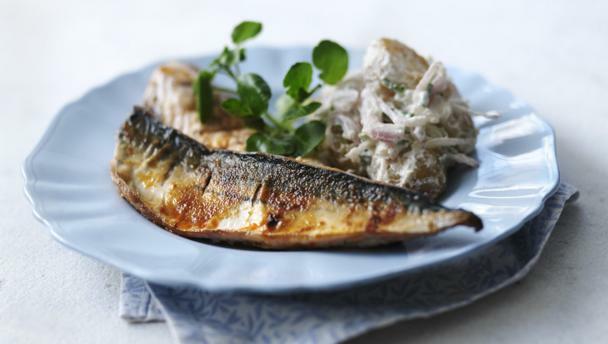 As soon as the mackerel are cooked, transfer to serving plates and spoon the horseradish potatoes alongside.